Star Hill Golf Club’s GM brings golf & travel to the lives of the physically challenged. The feeling first struck Steve Sewell years ago as he watched physically challenged participants roll, push and will themselves forward on the grueling course of the Boston Marathon. Out of the blue it took hold of him, the way a well-constructed novel or a stirring film stays with a person long after the ending. 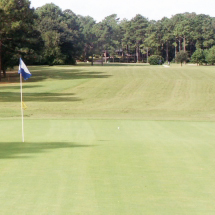 Sewell, the general manager and director of golf at Star Hill Golf Club in Cape Carteret, plans on many more of those moments in the coming months and years. Sewell has spearheaded an effort to bring to Star Hill a new instructional golf program for physical education teachers, caregivers, disabled golfers and their family members. The monthly program, called Train the Trainer, was scheduled to begin in June. The program, run through Sewell’s consulting company, Professional Golf Resources, will feature some of the top instructors in the field. The staff directory at the first seminar includes a former U.S. Olympic track coach and director of athletics for Special Olympics International, the director of golf for the Special Olympics in Maryland and the director of education for the National Association of Collegiate Athletic Administrators. The goal of the program is to teach those who work with the physically challenged how to bring golf into — or back into — the lives of the disabled. It is part of an ongoing, larger effort to make Star Hill and its surrounding area a destination for the physically challenged, whether the person’s condition is from birth or a disability acquired later in life. “A lot of them played golf and never realized they could be back into it,” says Sewell, an energetic, emotional longtime golf pro from the Boston area whose New England accent gives away his origin immediately. “There are a lot of products that will help them to do it, and if you have the right training to go with it, you can certainly encourage it without spending inordinately big amounts of money.” Specialized prosthetic limbs and golf carts help people with varying degrees of disability play the game. 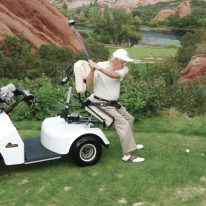 The golf carts, which cost around $8,000, have a single seat that swivels and moves at an angle, allowing, say, a golfer without use of his legs to drive right up to the ball and play it without having to leave the cart. Pace of play, Sewell says, will not be an issue to able-bodied golfers. Tom Durbin has seen it all work. As the vice president of sales for SoloRider, the only company that makes and markets the specialized carts, Durbin, like Sewell, tells stories of affecting golf epiphanies. “Those are the kind of things that really make this a payoff, and there’s just one story after another like that,” Durbin says from the company’s headquarters in Denver. According to the 2000 census, about 20 million Americans suffer from mobility impairments. Of those, about 7 million use some type of device to get around, whether it’s a walker, a wheelchair or a cane. About 2 million of those use a wheelchair. Durbin says about a third of those are golfers or would like to play golf. “It’s almost impossible to come up with a family that isn’t going to have someone within that family who’s had some travesty,” Sewell says. 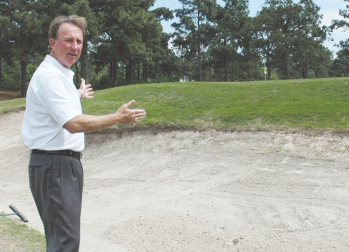 Star Hill has made slight modifications — most notably the leveling of some bunkers, which Sewell says needed to be done anyway — to serve golfers in the specialized carts. The tee boxes can be reached by cart, and there are no steps on the course. Plans for a golf school behind the range at the nearby Golfin’ Dolphin are in the works, and the area already has vacation accommodations that are fully equipped for the physically challenged. The brochure for Shell Cove, an Emerald Isle oceanfront rental home, boasts “special features designed to allow guests in wheelchairs the opportunity to fully enjoy a vacation at the beach,” such as an elevator, a roll-in shower and an electric lift over the bed. While the idea is to incorporate golf into the lives of people who might not otherwise have the opportunity to play, the program runs much deeper, Sewell says. “That’s our goal: Not only to make Star Hill a physically and developmentally challenged destination transcending golf,” says Sewell, “but whether it’s bowling, fishing or using some of the accommodations we have that are way beyond what the norm has for the physically challenged. People can come in here and feel comfortable as a family.” Sewell remembers with amazement the sea of disabled participants making their way past his spectator’s post at the Boston Marathon back home every year. Later, as a club pro up north, he met two accomplished blind golfers and came away impressed at their ability to play the game. ​Unlike many who get involved in charitable pursuits, neither Sewell nor his family has been affected personally by the cause he’s helping. It was his experiences teaching the challenged, like the old man in Wilmington, that motivated him to bring the seminar to Star Hill. “I think it’s like when your team wins the World Series or anything else where you overcome adversity,” he says with the enthusiasm of a man who’s found his calling in life. “It’s the heart of a real good movie. Even if it’s a happy ending, people are crying. Maybe I realize how fortunate I am that no one in my family has had to go through something like that.” Sewell has worked closely with Lois Williams, a grant writer and non-profit business specialist in Annapolis, Md., who is relocating to the area to assist with the program. Their ultimate goal is to build a golf facility for the physically challenged, whether it’s in North Carolina or elsewhere. The dream would require a substantial monetary contribution. Most of all, Durbin says, the program will help its participants.